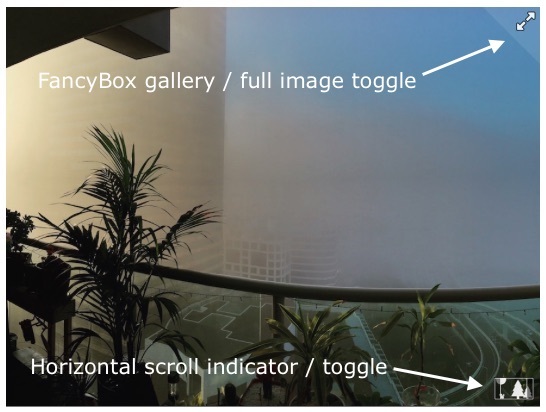 I've created the jQuery UI Photoboxr plugin while working on Travel µBlog so that I could easily display panoramic photos in 4:3 aspect ratio boxes. Over the weekend I've updated Photoboxr to version 0.2. This update brings a new, slick UI to the plugin and changes scroll calculations to be pixel based rather than percentage based. The pixel based calculations ensure that the clipping box doesn't show through when images are scrolled to their extreme left/right positions. New icons make it easier to see what's going with clearer (I hope) horizontal/vertical indicators. The FancyBox expand indicator has also been revamped to cover more space while obstructing the underlying image less (by using a semi-transparent overlay). Release 0.2 can be downloaded from Github here.